This year’s Black Friday is expected to be the “biggest day of spending of all time.” To put that in context, let’s look at last year’s numbers. 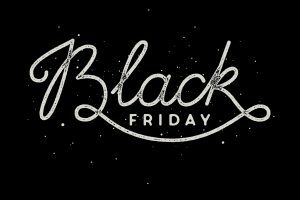 Black Friday 2015 racked up $2.74 billion in online sales, with 25 percent of all transactions originating from email marketing. Cyber Monday 2015 saw online revenue increase by a huge 16.2 percent from 2014, up to a total of $3.07 billion. And of that, 22 percent of orders came from email marketing. Though social media is certainly important when it comes to online sales, email has proven (at least to date) that it’s more reliable when it comes to getting shoppers onto your website and into the ordering process. It’s gotten to the point where retailers plan their marketing strategy for this heavyweight November duo months in advance — but what can you do to punch up your email marketing in these last weeks before the two big days? Read on for our tips. 1. Hook them with the subject. Every single retailer will be running an email campaign for Black Friday and Cyber Monday. Your goal, then, should be to come up with ways to stand out in your customers’ inboxes. The first step is to create a compelling subject line that makes your message pop among the hundreds (or thousands) of other Black Friday- and Cyber Monday-related paraphernalia your audience will be bombarded with. Overwhelming, right? 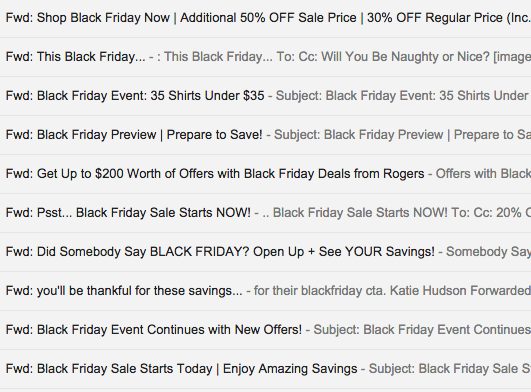 In most cases, people faced with an inbox like this will ignore or delete pretty much everything — with the exception of emails from retailers they already have relationships with. But the best rule of all? Be original. Remember those 2015 online revenue numbers we mentioned? On Black Friday, $905 million of the total $2.74 billion came from mobile sales. And on Cyber Monday, mobile accounted for $799 million of the total $3.07 billion. So it’s a good idea to assume that most of your customers will open your Black Friday and Cyber Monday emails on a mobile device. keeping your messages relatively copy-free (light on words to avoid clutter) so they’re easy to view and ingest on smaller screens. 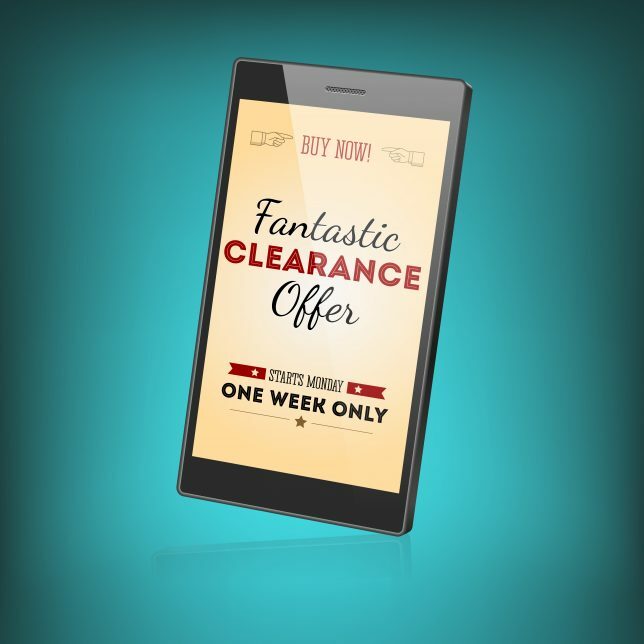 using mobile device detection to push shoppers to an optimized version of your website. 3. Focus on the visuals. For maximum impact (especially on mobile), you should give priority to statement-making visuals. Choose an overarching theme that fits your brand, and stay true to that in the look and feel of your emails. Animation: Using simple GIFs in your Black Friday and Cyber Monday email marketing keeps the tone light and fun and aids in piquing potential customers’ curiosity. 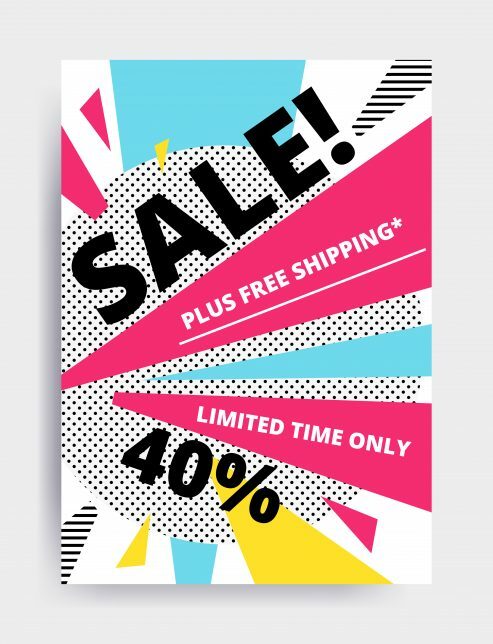 This example from Forever 21 (which also showcases mystery offers, another popular marketing tactic for these two huge shopping days) pairs a clean black background with minimal text and a bold CTA. Minimal color palette: This email from Topshop is a great example of the power of simplicity. The big draw (“Up to 50% Off Selected Lines”) stands out in that mint-green color, and the CTA is clearly offset in its solid black box. Product-focused: This is an excellent alternative to animation, bold text, and simple color palettes. Place a few of your bestselling or most popular products in a holiday display, snap some photos for email, and craft marketing using whichever picture best showcases the products. You could even put together a couple of different versions and send them out in segmented blasts to collect data on which types of visuals work best for your customers. Regardless of the type of promotion you’re running (online-only, in store-only, or both), you should consider offering incentives to your potential customers. In general, people like feeling as though they’re getting a special deal reserved only for them. To appeal to this tendency, you could offer an “exclusive” discount to the first 100 or so customers who place on online order or make an in-store purchase. Shoppers also love receiving free shipping, freebies, small gifts, or add-ons with their purchases. 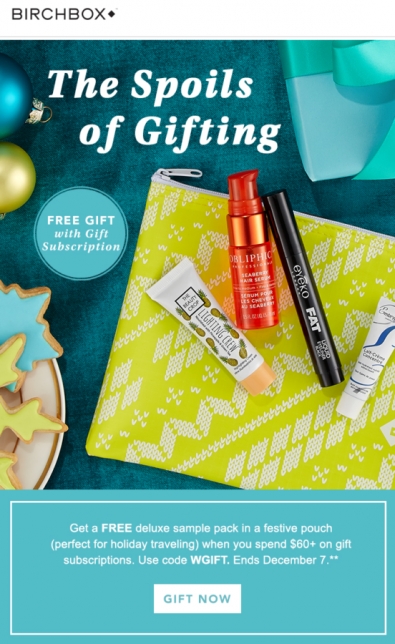 Consider crafting email marketing around some sort of “free gift,” such as Birchbox did in the product-focused visuals example we showed you above. And don’t forget: once you’ve decided if you’ll be offering incentives, make sure your potential customers know about them. Plug them in your social media messaging, and make them the focal point of your emails. 5. Emphasize ease and convenience. Even though a majority of people these days begin or complete their holiday shopping before Black Friday and Cyber Monday, ease and convenience are still huge factors when it comes to whether or not someone will complete a purchase with you. If at all possible, you should make these points into prominent features of your email marketing campaign. Create a gift guide catering to both your regular customers and the friends, family, and loved ones who’ll be buying gifts for your regular customers, and include the guide in one of your emails. Write subject lines implying that you’ve done the work for potential customers (such as “Your one-stop shop for holiday gifts” or “Cyber Monday #winning: free shipping and returns!”). If there’s a key element of your business pertaining to ease and convenience, focus on it. Make sure shoppers know you offer free shipping, same-day delivery, complimentary gift wrapping, gift cards, or whatever else might draw them to you over other retailers. Just as you’ll likely start your Black Friday and Cyber Monday email marketing at least a week in advance, you should keep the momentum going a few days after the noise has settled down in order to fully maximize sales. This time of year is crazy for everyone — and in the rush, customers might get interrupted during the ordering process. Be sure to follow up on those abandoned carts, and consider offering a little something extra (free two-day shipping, 10% off) to push people toward that purchase button. Another thing many retailers do? Extend their sales and promotions. If you decide to follow suit, send emails on Saturday and Tuesday to let customers know your Black Friday and Cyber Monday discounts are available for some additional time. You could also level up your promotions and offer heightened sales for a couple of hours. 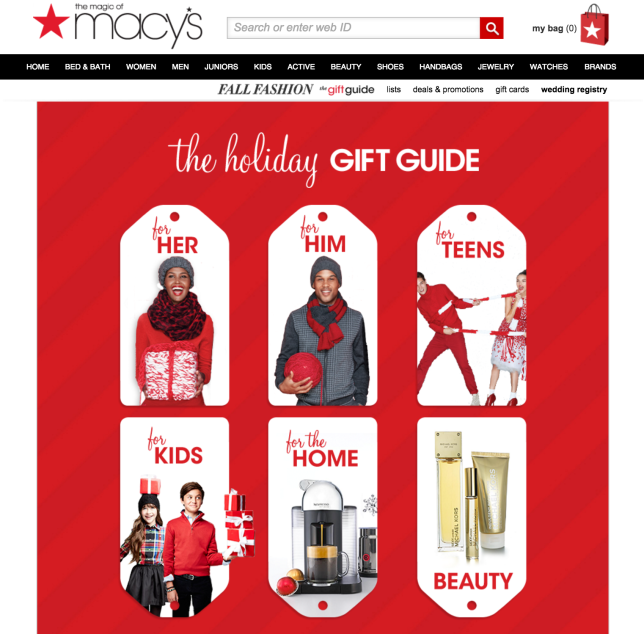 What do you have planned for your Black Friday and Cyber Monday email marketing? Will you use any of the tips we outlined here? Let us know in the comments. Want to learn even more about email marketing and how to use it to increase subscribers and grow sales? Click here to download your free copy of our Email Marketing Guide for Retailers. 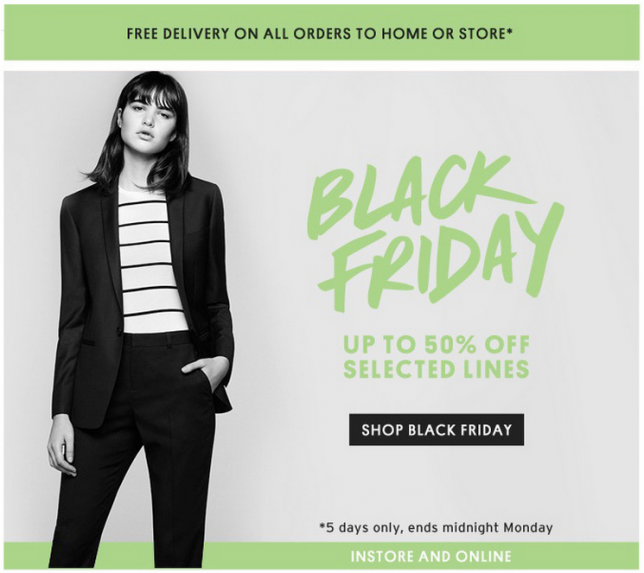 The post 6 Last-Minute Tips for the Best Black Friday and Cyber Monday Email Marketing appeared first on Vend Retail Blog.